Sunrise, Sunset (Revolution) consists of nine triptychs of graduated heights that appear to rise and fall like abstract mountains, and correspond to the Sun’s path from east to west horizons. 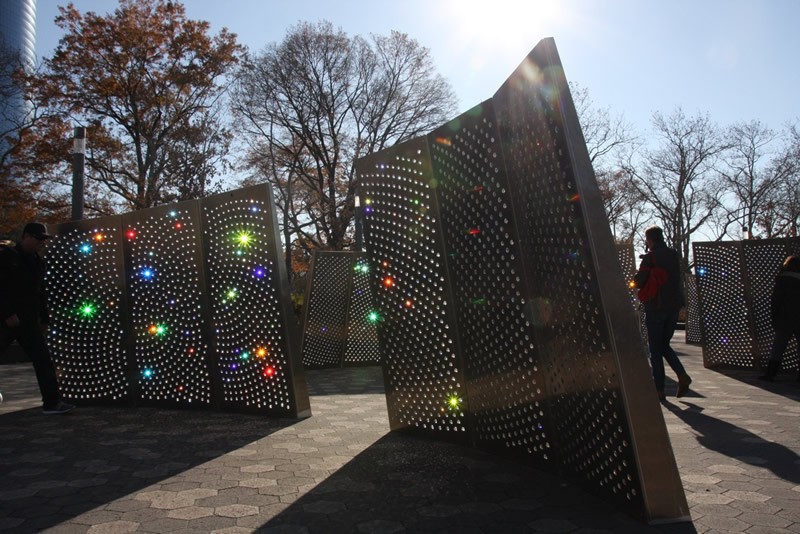 Three thousand prisms are held within the aluminum panels. Wide arms beckon with sparkling red, orange, yellow, blue, green and violet lights, drawing visitors near. People are playfully surprised to find clear glass activated only by natural light. Prisms create countless rainbows on visitors’ feet and other surfaces. The prisms’ curved compositions follow the Golden Ratio, again linking natural science and art. The title offers a parenthetical, perhaps humorous reminder that Earth is spinning on an axis and traveling around the Sun, enormous but generally overlooked facts. Reflecting the artists’ intention that art and beauty is for everyone, the site-specific work on Pier A Plaza was assembled with public participation. Taking over its corner of the park with gleeful abandon, Tom Otterness’ whimsical sculptural installation entitled The Real World is one of New York’s most popular public artworks. Cast in bronze, the sculptures feature Otterness’ signature cartooish figures: animals and people, bankers and robbers, laborers and pilgrims, predators and prey, all rubbing shoulders in his delightfully loopy narrative world. There is an entire bustling society in miniature including frogs wrestling over a moat, a titling tower and diminutive workers rolling giant pennies toward a multi-armed idol. Scattered nearby are a giant fist and feet and a bilbous-nosed creature seated on a bench pondering a bound animal that may be his next meal. Even as Otterness’ characters erect their monuments and enact their wile they remain oblivious to the giant viewer. Mixing levity and discord, biology and social commentary, Otterness’ fanciful world is always vividly entertaining. Tom Otterness’ other public commissions indude the Los Angeles Federal Court Plaza and the 14th Street/8th Avenue subway station, in New York City. Rising from the scenic lawns of Governor Nelson A. Rockfeller Park, below the junction of River Terrace and Warren Street, The Pavillion occupies a unique position in the landscape, as if negotiating a common ground between the greensward and the city beyond. Because the structure has no walls, both the park and the hubbub of downtown are eminently visible through its posts. The Pavillion is crowned by a handsomely crafted sqaure wooden roof, supported along its edges by twelve thin wooden pillars and at its center by four Doric style brick columns. Between the columns is an upraised platform girded by a bank of low stone steps, which provide ground-level seats for people-watching, hiding from the sun and looking out on the great lawn below. With its pared-down, classical elegance and appealing mix of styles, The Pavillion is a functional and symbolic waystation and a gracious response to the architectual cacophony of the surrouding city. Martin Puryear’s stately Pylons rise along the waterfront of the Belvedere, framing the sightlines of the Winter Garden. Both columns are made from stainless steel and are composed from six segments. In their contours they are a study in opposites. One is solid and all angles, thrustting downward; the other, an airy, volumetric weave of steel mesh gracefully spirals upward. Situated between the ferry dock and the North Cove Harbor, the Pylons are designed to be viewed from either land or water as a symbolic portal connecting the two. By day, they give the waterfront an identifiable landmark. By night, the two opposing columns are dramatically illuminated like beacons. As the first major public waterfront plaza built on the Hudson River, the Plaza was commissioned by the Battery Park City Authority as part of its public art program, and was conceived as a multi-purpose space, providing the pleasure of variety via a range of open space for individuals, intimate groups, as well as large public gatherings. Starting from the north, there is the wide-open space of the court outside the Winter Garden, with plenty of room for outdoor concerts, lunchtime gatherings, jogging, and other activities. Along the eastern edge of North Cove is seating designed by Scott Burton. Here you can watch the sunset and read passages from Walt Whitman and Frank O’Hara celebrating the exhilarating spirit of New York City, which Siah Armahani designed into the railings along the water. At the southern edge of the plaza is a more intimate park, in direct contrast to the civic scale and atmosphere of the northern part. This relaxing space has benches and tables, which line an oval lawn - perfect for quiet sitting and relaxation. Designed by Ned Smyth, The Upper Room is a handsome colonnaded court marking the entrance to the Esplanade at Albany Street. At once dignified and playful, reverent and inviting, this self-contained sculptural environment suggests a contemporary reimagining of an ancient Egyptian temple offering stylized sanctuary from the surrounding city even as it formally echoes the rhythms of its urban environment. On its sides the work is girded by ruddy red pillars made of gravelly conrete aggregate recalling a fusion of decorative palm trees and Near Eastern architecture. Inside, it features a long table adorned with chess boards and twelve stools and an altar-like pergola sheltering an iconic palm tree. Like the tree form rising out of the table, this pillar is inlaid with colorful moasic tiles. Designed to be both functional and symbolic, The Upper Room lends an appealing air of ceremony, harmony, and mystery to its site overlooking the waterfront. R.M. Fishcer’s Rector Gate is a festive archway marking the intersection of Rector Place and the Hudson River Esplanade. Built of Steel, bronze, and granite, and rising 50 feet high, the gateway draws its inspiration both from past and future, from Constructivism and Science Fiction, in the artist’s signature style. It is part Gotham, and part Metropolis; and one almost expects to see bolts of electricity rising up its shafts to the skeletal cupola and fanciful spires of its crown. In its energetic, theatrical design, Rector Gate Bridge brings the romantic grandiosity of New York’s early skyscrapers and engineering feats down to human scale. The arch features seating at its base and is illuminated at night to add to it’s drama. Artschwager’s installation consists of five separate pieces situated at the junction of West Thames Street and the Esplanade. At the center is a street lamp shrunken to squat proportions, surrounded by a wooden armature imitating its crown and girded by an upraised circular bench and table. A second circular seating area resembles an enlarged tree grating. The ensemble is completed by a throne-like seat made of granite, and a pair of reclining, slatted wooden deck chairs. Together, these works transform their cul-de-sac into an eccentric public recreation deck and mark a witty reflection of their urban environment. South Cove is an unusual, meditative recess along the waterfront. Considered one of the country’s most significant public artworks, the work is the result of a unique collaboration between environmental artist Mary Miss, architect Stanton Eckstut and landscape architect Susan Child. South Cove encompasses everything from carefully sited rocks, natural plantings, and atmospheric blue lights along the Esplanade to the water-racked pilings and the large, arching wooden jetty at the southern corner of the cove that extends into the Hudson like a pier. The jetty gently curves inward, back toward shore, as if in mediation of the city from which it springs. Overlooking the view is a raised metal tower recalling the prow of a boat or the crown of the Statue of Liberty visible beyond. At once dramatic and serene, South Cove is a place where land and water, nature and metropolis, past and present, gently coalesce. Although they do not have human features, Jim Dine’s Ape &amp; Cat (At the Dance) exude the sort of civility and tenderness to which many urbanites aspire. Made of cast bronze, the figures are at onces amusing, allegorical, and unabashedly romantic. The work derives from a series of Dine’s 1990s drawings and sculptures that follow the relationship of this unlikely but adoring couple. Their sheltered placement along the promenade lends a sense of intimacy, joyousness, and unexpected grace to the site. Eyes marks a departure for the artist in that the subject, unlike previous treatments, is explored as two large units representing eyes separated from any suggested surrounding physiognomy. Resting directly on the ground a calculated distance from each other, they occupy considerable volumes of space between and around them which the viewer is invited to fill in with his or her own imagination. Thus a giant’s head emerges in one’s mind. The works are carved in granite with pupils suggested by large polished nodules. These are not inset but are integral part of the whole granite “eyeball”. Created by British artist Tony Cragg, Resonating Bodies consists of a pair of bronze sculptures resembling giant musical instruments. One resembles a lute, the other, a tuba. This playful work is based on the concept that all physical bodies, including ourselves, are constantly enveloped by various energy forms from heat, light, sound, and gravity to magnetic waves, x-waves, even radio and TV signals. The sculpture displays these forces with a wave-like relief on its surfaces. The work is set on the ground at the end of the tree-lined walks at the entrance to Robert F. Wagner, Jr. Park. With its whimsical design and gargantuan scale, the work invites touching and interaction. Ugo Attardi’s Ulysses, a figure of warmth and energy is defined by the artist as II Modern Baroque. The body, fierce with beauty and Hellenic elegance is united to, and contrasted with, the helmet-mask, which hides and reveals weakness and complexity in the face of the warrior-hero. The dark mask, a chameleon-like piece of armor, resounds with aggressiveness and outrageous pride. Through the bronze, Attardi has tried to give life to the figure’s daringness and vitality as well as geometry of dance and the unrelenting thirst for knowledge.